Are you despairing of ever finding effective help for your child or teenager? Perhaps you’re doubting that anything can help? Have you tried other services only to find they did not work? And now your child is digging in their heels and being resistant to any suggestions and are isolating and hiding instead? Are you tired of everyone else having an opinion about your child or teenager’s problem; you know they just don’t “get it” and you just want to find a sensible solution that actually works? Why not apply for a no obligation WayForward Consultation and find out if this is the right approach and the right time for you and your family? The WayForward Consultation will give you clarity about the best way to proceed. You will come away understanding the various options that could help your child. Just knowing that there is a solution and a way forward is reassuring, giving you a sense of relief and a feeling of hope. You will have peace of mind that you are making an informed choice for your child. 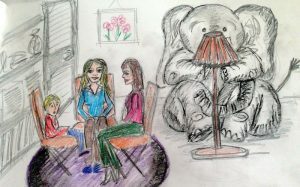 A consultation with me is a non-judgemental space where you can share your feelings openly and be met with compassion. Sharing in a confidential setting with someone who understands will halve the burden. Knowing that you are not alone is a deep comfort. There will be no judgement – I talk to parents like you every single day so I’ve seen it all before. I promise nothing you tell me will shock or surprise me, and neither will I blame you. Telling the whole story to someone who doesn’t know you can be very insightful. It can throw light on issues and give you an awareness that will empower you in your relationship with your child and family. The WayForward Consultation takes place online which means there is no travelling time. It is ‘free & hands-free’ so you can make notes and both parents (and any blended bonus parents) can attend the call. Calls can also take place via telephone if preferred. The WayForward Consultation is completely free and there is no obligation to take up my services. There are a limited number of sessions available each month so please click to book your appointment. “The WayForward Consultation with Inger turned out to be the best ever investment of an hour of my time. Her ability to listen deeply combined with her intuitive understanding of my son’s problems gave me a whole new perspective and I came away feeling hopeful and heard. As for solutions she gave freely of her expertise and I came away with a hands-on & instant ‘plaster’ that I have been using for the last week to really good effect.